Pen and paper are joining anachronisms like typewriters and analog televisions. Have no fear artsy types! On-the-go creative individuals can still fuel their creative urges and express themselves using apps like miniDraw, a vector-based graphics software program for the iPhone. Developed by Cristian Miehs, the app is a more streamlined version than its iPocket cousins. MiniDraw comes in two versions: lite and full. The lite version is easy to use and allows the user to play around with layers, opacity, and vector shapes to create everything from doodles to detailed artwork. Artists can also clone and mirror images, choose from an impressive RGB color selection (a color model in which Red, Green, and Blue are combined to produce different colors), and select different background images. The full version has all the features of the lite version, while also enabling users to export Scalable Vector Graphic (SVG). For non-graphic artists, SVG is a graphic file format written in a coding language that allows images to be scaled smoothly to different sizes. This allows the images to be usable in almost all vector pages. Users also gain access to the scene gallery, and they have the ability to save multiple scenes. And best of all, there is no pesky watermark. 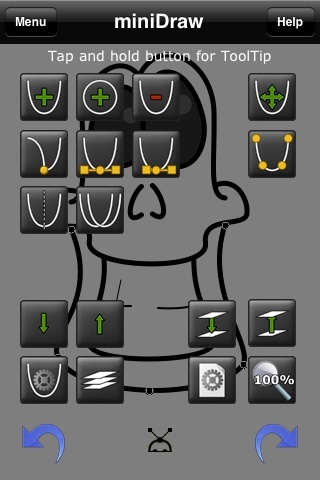 Users can check out all the features online at http://www.minidraw.net/ without having to download the app. They can also see the dedication Miehs has to this project. He is quick to address comments and concerns on posts submitted to the website’s discussion page. The app was very well thought out with additional features like zoom capability and a short but comprehensive tutorial. My gripes about the game are few in number. The music playing during the tutorial was the equivalent of nails on a chalkboard–not everyone enjoys trance music. And the drawing in the tutorial of a weird bug-eyed alien creature was ugly. Miehs might consider showing a quick drawing of the robot that shows up at the start-up instead. Overall though, miniDraw is great for graphic artists and dabblers in creating vector based artwork. The lite version was $0.00, and the general consensus so far has been mostly positive for the full version too. AppSafari review of miniDraw was written by Linda Ta on March 11th, 2010 and categorized under App Store, Free, Fun, Games, Line Drawing, Utilities. Page viewed 5532 times, 1 so far today. Need help on using these apps? Please read the Help Page.